Discover the light of Christmas in a world of hardship and hope. Even during hard times, the light of Christmas shines brightly. Home for Christmas shares the real-life stories of formerly incarcerated men and women as they find work and opportunity through Homeboy Industries in Los Angeles, California. 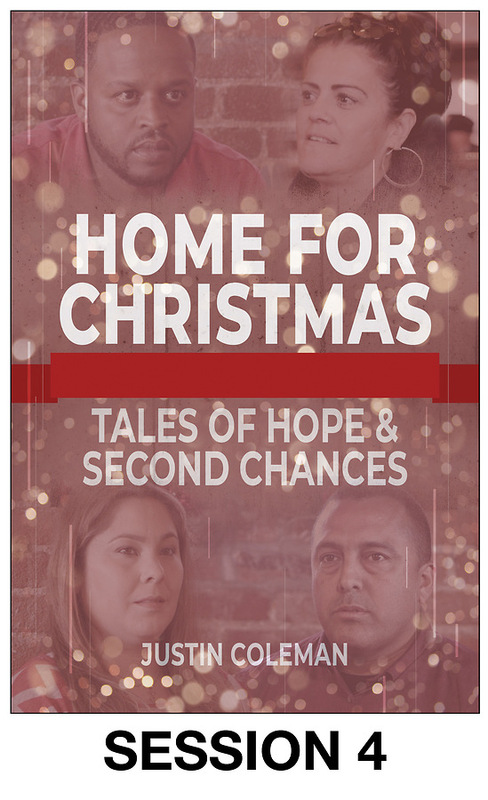 As we hear about their struggles, we recognize the Advent themes of hope, love, and peace in their lives. This four-session book is ideal for Sunday school, small groups, and home groups as well as for individual study. The four-session DVD features author and pastor Justin Coleman presenting to a group in his challenging and engaging style. The DVD also includes interviews with Homeboy participants about their experiences. The video segments are approximately 8-10 minutes each and, when combined with the four book chapters, make an ideal four-week group study for Lent and beyond. All videos sessions are closed captioned. In Session 1, the focus is on the Advent theme of hope. We are introduced to Homeboy Industries, their mission, and hear the story of Janet, whose life was given new hope thanks to the efforts of Homeboy Industries. Rev. Justin Coleman helps us to then examine where we find hope in our own lives. In Session 2, the focus is on the Advent theme of love. We meet Marcus who talks about how the love shown to him by Homeboy Industries has transformed his life for the better. Rev. Justin Coleman asks us how we might find ways to show love to those around us. In Session 3, the focus is on the Advent theme of joy. We hear from Mariana, who describes how Homeboy Industries has helped her to find joy in her accomplishments and to share in the joy of others. Rev. Justin Coleman challenges us to find joy even in the middle of the challenges in our lives. In Session 4, the focus is on the Advent theme of peace. We meet Boris who describes how Father Greg Boyle, founder of Homeboy Industries, helped him to find peace in himself and in God. Rev. Justin Coleman speaks to us on being ambassadors of peace.